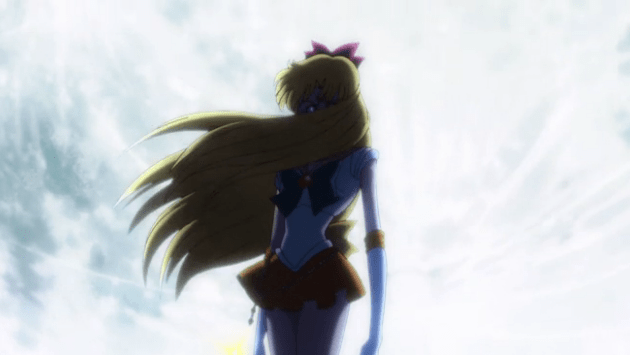 WARNING: The following article contains SPOILERS for Sailor Moon Crystal Acts 8, 9, 10, and 11. If you don’t want to be spoiled, please stop reading. You have been warned. Before I start this commentary off, I should probably disclose something to anyone reading this: I am not Antonin Koronek. I know this must be a real shock to you all, but it is something that I should bring up. Since the last commentary he wrote, he has left oprainfall. As a result, oprainfall needed someone else to cover the remainder of the season. This means I get to be your new dictat— Err, I mean your new commentator. Now it goes without saying that my style of writing will likely appear different from Antonin’s, so those who may have gotten used to his may notice a difference. Also, it is worth mentioning that my perspective when it comes to Sailor Moon as a whole is a bit different. Unlike Antonin, I have actually never seen the original series. I was somewhat familiar with it through what I have heard others say, but I have never actually seen it myself. I also do not have knowledge of any future plot events. So as a result, this is my first exposure to this franchise, and I will be focusing on it as its own series rather than how it compares to the original. To quickly sum up my impressions on the first seven episodes, I can say I was quite satisfied with the series. Comparing this to what little I know of the original series, I could tell that there was an effort to try and work around any of the commonly used tropes the original series pioneered, as well as any aspects of the original that may not have held up well (again, from what I have heard). Mainly, I noticed the series was not nearly as formulaic as I heard the original series was, and there is better pacing. Only the first five episodes really follow the formula the series is (supposedly) known for, and it starts to form an overarching narrative starting with the seventh episode (which is coincidentally where Antonin stopped at). So far, I can say that I am quite satisfied with how this series is going. The conflict is engaging, the characters are likable, the visuals and music are amazing, and it all just works very well. Yes, one could point out some flaws if they really wanted to, but that would be discrediting a lot of the well-handled aspects of the show. I also like how it never feels like the series tries too hard to modernize itself or change to fit a new audience. 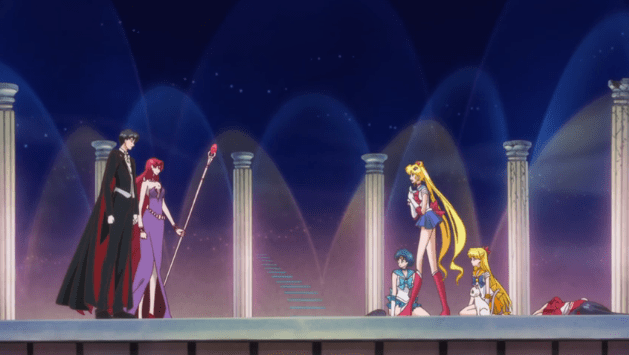 Despite having done things differently from the original series, I can tell Sailor Moon Crystal is focusing on making sure it still retains the core charm the original series had. Picking up at the end of Act 7, where Sailor V saves the day, Act 8 begins with Sailor V introducing herself as Minako Aino, a.k.a. Sailor Venus. 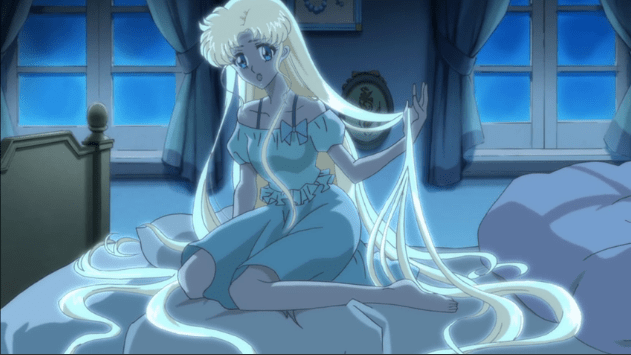 Artemis, Sailor V’s cat counterpart to Luna, claims Sailor V is Princess Serenity of the Moon Kingdom and explains the Dark Kingdom’s plans to revive Queen Metalia. The next day, Usagi has a dream about someone named Endymion (who looks suspiciously like Mamoru), and then runs into Mamoru. The two of them share a moment with each other before another action sequence begins. This one occurs when Kunzite causes a blackout throughout the city and tries to lure Sailor V away in order to get the Legendary Silver Crystal. Eventually, the other Sailor Guardians begin to catch on, and a fight scene occurs. Kunzite tries to launch an attack at the Sailor Guardians, but Usagi disrupts it and saves her friends. When Kunzite tries to use an attack on Usagi, Mamoru shows up as Tuxedo Mask and serves as yet another dues ex machina, taking the brunt of the attack. The episode then ends on a cliffhanger at Usagi’s reaction. Eh, he’ll be back. Just give it an episode or two. One thing I must touch upon is how the romance between Usagi and Mamoru is handled. Admittedly, I am not entirely sure, seeing as how there has not been much screen time between the two. However, I do suppose that both of them saving the other’s life counts as being close to each other. I am also willing to buy into it a little more, seeing as how they are both reincarnations of star-crossed lovers in a previous life (which you technically do not find out until the next episode). I can also praise the series for not making either of them seem any less competent than the other. Despite Mamoru having no powers as Tuxedo Mask, he still manages to handle himself quite well and puts up a decent fight. It is quite a breath of fresh air to see a character in an action-based anime who has no powers yet is not useless when it comes to the fight sequences. Also, I have noticed Usagi seems to be handling herself well, unlike what I heard about the original, where she supposedly ran away from everything. Act 9 begins with a sequence that makes it look like Mamoru is about to die. 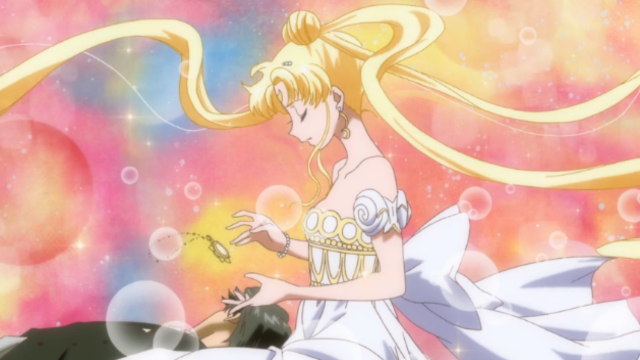 The series then goes full Pokémon movie on us and has Usagi’s tears cause her to reawaken as Queen Serenity and pass the Legendary Silver Crystal’s energy on to Mamoru. Yeah, the series does just kind of drop on us that Sailor V is not actually Princess Serenity and that she only claimed to be in order to protect Usagi. Afterwards, Kunzite reveals this was part of his plan. 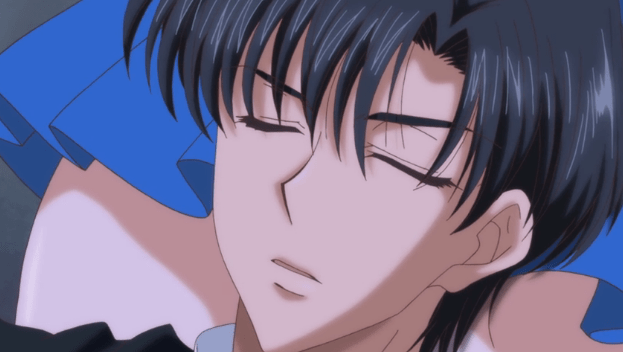 He then kidnaps Mamoru, while the others restrain Usagi from trying to stop him…for some reason. To be honest, that part of the episode bugged me a bit. Maybe there is some type of plot-mandated explanation for why it would not have been a good idea to let Usagi go, but it just feels like a cop out to me. Also, it feels rather anti-climactic to not even see her try to stop Kunzite. Why not just have Usagi try and reach him but get knocked back by some type of attack? Yes, it wouldn’t have been as different, but it would have been better than having her teammates restrain her. For once, an anime acknowledges that a character’s hair can get way too long. After the fight, Usagi has to deal with the whole you-are-actually-a-different-person-than-you-thought-you-were-and-are-having-memories-from-a-past-life-return predicament that was dropped on her earlier. Naturally, she is having a bit of an identity crisis and is rather depressed that people may view her as Princess Serenity instead of Usagi. However, the rest of the Sailor Guardians come to assure her that she was reincarnated for a reason and that she is not supposed to take over the role as Princess Serenity. They then discuss their plan of action and decide they need to go to the moon. 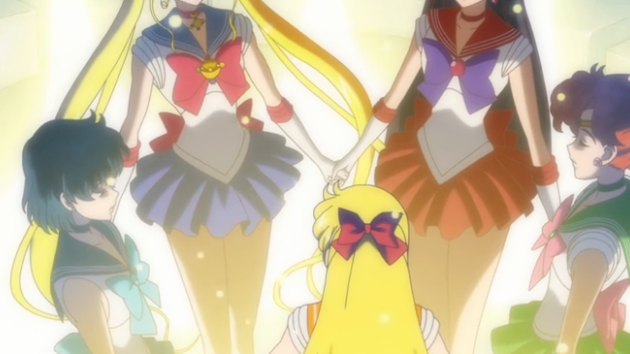 Act 10 has the Sailor Guardians being taken to the moon for an expository plot dump. They learn that Mamoru is still alive and that the Four Dark Kings used to be knights who served Endymion. Afterwards, there is a fight scene between the Sailor Guardians and the Four Dark Kings. The Sailor Guardians are about to release the Dark Kings from their brainwashing, but they escape before it can happen. The episode then ends on the cliffhanger of Mamoru being brainwashed by Queen Beryl. Regarding the last two episodes, I can say they remind me a lot of playing an RPG when you get to the point of the storyline where they just dump a whole lot of backstory on you at once. It is basically the point where you know the direction of the story is going to change and take a more focused route. I am definitely glad this series decided to get to the point and focus on an overarching plot. So far, the plot has been pretty strong and has been keeping my interest pretty well. The eleventh Act (and the last for this commentary) is about Usagi finding someone who looks like Mamoru, only to discover that this person has the ability to brainwash others. He tries to manipulate Usagi into revealing the location of their base underneath the arcade, but Usagi does not fall for it. Unfortunately, the doppelgänger still manages to get in, leading to a fight scene against the fake Mamoru. Usagi is hesitant to fight fake Mamoru until he attacks Luna. This pisses Usagi off, and she heals Luna with Moon Healing Escalation. Afterwards, Queen Beryl shows up and tells them this was the actual Mamoru, who has been brainwashed to work for them. My overall impressions on the series so far are pretty positive. One specific touch I liked about Act 11 was how Usagi’s transformation did not have the typical heroic music and that it was more somber in order to reflect her mood. I also liked that they did not exaggerate Usagi’s doubtfulness too much. In general, I am impressed with how this series manages to portray some anime tropes that are usually seen as clichéd, yet is able to use them to a more reasonable degree. The series remembers that any trope can be done well if used correctly and does not simply think a trope can no longer be used without having someone’s eyes roll at it. While I have seen a lot of these plot threads before, I do feel they are being used well, and there is not much to dislike about the series. There’s not much else to say other than that this is a very solid action series, and I am enjoying the direction it is taking. Once a character hurts a kitty, they have pretty much gone beyond redeemable. Sailor Moon Crystal is simulcast on Crunchyroll every first and third Saturday of the month at 3:00 AM PDT for both premium and free users.